When the first Motel 6 opened its doors in 1962, rooms were only $6 per night. These days it seems like it&apos;s difficult to find quality rooms for under $75, but it&apos;s not impossible. In some cases, you&apos;re better off staying at a highly rated 2-star hotel for half the price of a subpar 4-star hotel. From the world&apos;s best chain motels, charming boutique inns, A-frame glamping cabins and even a hostel overlooking the Golden Gate Bridge, here are 17 cheap hotels to consider booking for your next getaway. Most have starting rates less than $100 (subject to season and availability). All have a 4-star or higher rating on TripAdvisor. Two of the properties have even achieved the elusive 5-star perfect score! Chattanooga may not be the first place that comes to mind when you think vacation. But there&apos;s a reason, or lots of them, that it made Lonely Planet&apos;s prestigious list of the top US places to visit in 2018. It&apos;s one of the most underrated riverfront cities in the country. 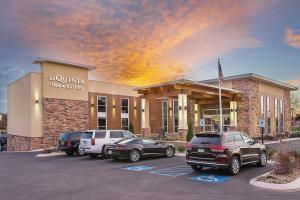 And because it&apos;s relatively undiscovered, it&apos;s also home to affordable quality hotels like La Quinta by Wyndham Chattanooga - East Ridge. This three-star hotel&apos;s two-digit nightly rate includes a free hot breakfast. Fido also stays for free. What sets this hotel apart from others in the same price range is its overwhelmingly positive reviews. Nearly 92 percent of reviewers rated it above average.